Hertfordshire ( or ; abbreviated Herts) is a county in England. It is one of the home counties and is bordered by Bedfordshire to the north, Cambridgeshire to the north-east, Essex to the east, Buckinghamshire to the west and Greater London to the south. The county town is Hertford. 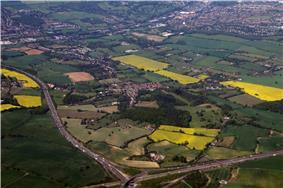 There is evidence of humans living in Hertfordshire from the Middle Stone Age. It was first farmed during the Neolithic period and permanent habitation appeared at the beginning of the Bronze Age. This was followed by tribes settling in the area during the Iron Age. Following the Roman conquest of Britain in AD 43, the aboriginal Catuvellauni quickly submitted and adapted to the Roman life; resulting in the development of several new towns, including Verulamium (St Albans). It was here in c. 293 that the first British martyrdom took place. 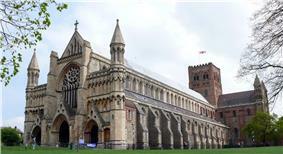 St. Alban, a Romano-British soldier, took the place of a Christian priest and was beheaded on Holywell Hill. 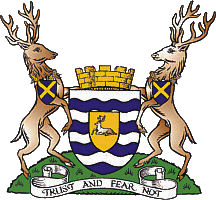 His martyr's cross of a yellow saltire on a blue background is reflected in the flag and coat of arms of Hertfordshire as the yellow background to the stag or Hart representing the county. He is the Patron Saint of Hertfordshire. On 17 October 2000, the Hatfield rail crash killed four people with 170 injured. 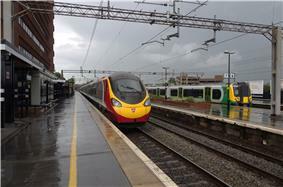 The crash exposed the shortcomings of Railtrack, which consequently saw speed restrictions and major track replacement. On 10 May 2002, the second of the Potters Bar rail accidents occurred killing seven people; the train was at high speed when it derailed and flipped into the air when one of the carriages slid along the platform where it came to rest. In early December 2005 the 2005 Hemel Hempstead fuel depot explosions occurred at the Hertfordshire Oil Storage Terminal. Hertfordshire is located immediately to the north of Greater London and is part of the East of England Government Office Region. Much of the county is part of the London commuter belt. 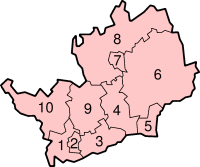 To the east of Hertfordshire is Essex, to the west is Buckinghamshire and to the north are Bedfordshire and Cambridgeshire. The county's boundaries were fixed by the Counties (Detached Parts) Act 1844 which eliminated exclaves. They were amended when, in 1965 under the London Government Act 1963, East Barnet Urban District and Barnet Urban District were abolished and their area was transferred to Greater London to form part of the present-day London Borough of Barnet. At the same time the Potters Bar Urban District of Middlesex was transferred to Hertfordshire. As part of a 2002 marketing campaign, the plant conservation charity Plantlife chose the Pasqueflower as Hertfordshire's county flower. Hertfordshire has headquarters of many large well-known UK companies. Hemel Hempstead is home to DSG International. Tesco is based in Cheshunt. Welwyn Garden City hosts Roche UK's headquarters (subsidiary of the Swiss pharmaceutical firm Hoffman-La Roche) and Cereal Partners production facilities, Pure the DAB radio maker is based in Kings Langley. JD Wetherspoon is in Watford. Comet and Skanska are in Rickmansworth, GlaxoSmithKline has plants in Ware and Stevenage. Hatfield used to be connected with the aircraft industry, as it was where de Havilland developed the world's first commercial jet liner, the Comet. Now the site is a business park and new campus for the University of Hertfordshire. This major new employment site is home to, among others, EE, Computacenter and Ocado. A subsidiary of BAE Systems, EADS and Finmeccanica in Stevenage, MBDA, develops missiles. In the same town EADS Astrium produces satellites. The National Pharmacy Association (NPA), the trade association for all of the UK's community pharmacies, is based in St. Albans. 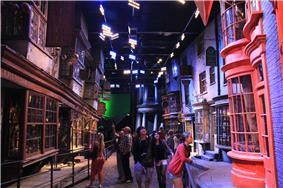 Warner Bros. also owns and runs Warner Studios in Leavesden. 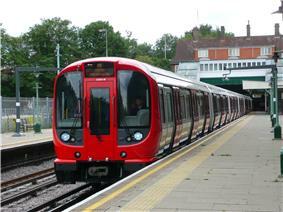 the Croxley Rail Link, which diverts the Metropolitan branch line to Watford Junction, is scheduled for completion in January 2016. Two international airports lie just outside the county Stansted and Luton. At Elstree, there is a busy airfield for light aircraft. The Grand Union Canal passes through the west side of Hertfordshire, linking Rickmansworth, Watford, Hemel Hempstead, Berkhamsted and Tring. Intalink is an organisation run by the county council that manages the transport. Animal Farm on the village of Wallington, Hertfordshire where he lived between 1936 and 1940. Manor Farm and The Great Barn both feature in the novel. Acclaimed seventeenth-century poet and romance writer Hester Pulter was a resident of Broadfield, Hertfordshire. 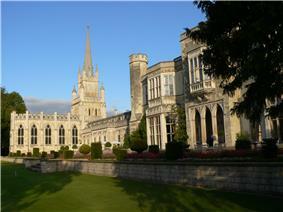 The town of Berkhamsted was home to the Christian poet and hymn-writer William Cowper and to novelist Graham Greene. Violinist Thomas Bowes was born in Welwyn Garden City, Hertfordshire. American composer Jeff Wayne (his musical version of The War of the Worlds) resides in Hertfordshire. Other present day celebrities born in Hertfordshire include Guy Ritchie, Vinnie Jones, Victoria Beckham, Sarah Brightman, Geri Halliwell, Charli XCX and Simon Le Bon. ^ "The East of England". ^ "About the chalk mines". Dacorum Borough Council. 2008. Retrieved 7 February 2009. ^ Hassan, Jafar. "UK Quality of Life Index". uSwitch. Retrieved 14 November 2013. ^ Regional Gross Value Added, Office for National Statistics, pp. 240–253. ^ Robson, Mark. Pulter [née Ley], Lady Hester. Oxford DNB http://www.oxforddnb.com/view/article/68094?docPos=1 . Retrieved 12 October 2013. Hertfordshire architecture Hertfordshire architecture, information on key buildings.